Spend time on the River Wye near Monmouth learning how to succeessfully paddle the River Wye taking in the Symonds Yat rapids along the way. Your instructor will teach all the basic skills required & is an ideal activity for all abilities. 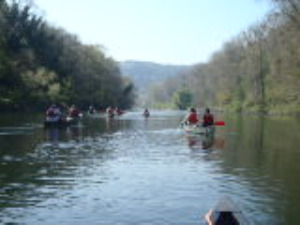 Learn the basic skills and techniques of open canoeing to navigate the River Wye successfully. Prices for adults £40 and children £30 for a 1/2 day session. Look out for discounts, special offers and events.